Tennis has always been a much-loved sport. And for all the tennis enthusiasts in the city who’re not members of sports clubs but would love to play the sport irrespective of it, it may be difficult to figure out courts that are open for all. Here, we’ve compiled a list of public courts in Mumbai to soak in the pressure of the game and enjoy your heart out. It is a sprawling institution right in the centre of the city on the beautiful seafront with a posh frontage and turf lawns. The Club was set up in Mumbai in 1950 and it began with few sports facilities such as tennis, badminton and regular bouts of freestyle wrestling at the Vallabhbhai Patel Stadium. There are a total of six hard courts here and the monthly membership fee is INR 675. The timings are 6am to 10:30am and 3:30pm to 7pm in the evening, and guests can also avail the services for INR 250 per day. The academy has played an important role in the upbringing of tennis players Sania Mirza, Purav Raja, Divij Sharan to name a few. MSLTA has five international size courts, three side courts and a mini court for training and tournaments. Any person can utilise the facilities, except during the regular coaching hours. Players have to book the courts in advance. They also run coaching programs for various age groups which run for almost six months commencing from April. The registration fee is a onetime payment of INR 950. Fitness enthusiasts can enjoy a perfect workout or indulge in lively sports at the Grand Hyatt, Mumbai because they have amazing facilities for those interested in tennis, beach volleyball and basketball, all within the hotel’s premises. Club Oasis Fitness Centre and Spa offers an advanced experience in fitness equipped with state-of-the-art equipment. For tennis, one can avail eight sessions (60 minutes each) for INR 7,000 plus taxes for a month. A single session of 60 minutes can be availed for a fee of INR 1,250 plus taxes (includes court fee and pro-marker fee). An additional fee of INR 200 plus taxes will be levied for usage of floodlights, INR 250 plus taxes for rackets and INR 300 plus taxes for a set of three tennis balls. In NMSA, sports is considered an integral part of developing a competitive and a winning attitude. Like any other sport, tennis is considered a game of nerves and strategic thinking and the top-quality tennis court serves just that. The NMSA club has six tennis courts with an all-weather synthetic surface. Flood lights are available to play after sun down. Markers and coaches are available to play with. The NMSA also has an exclusive training programme with high performance coaching for children and adults. 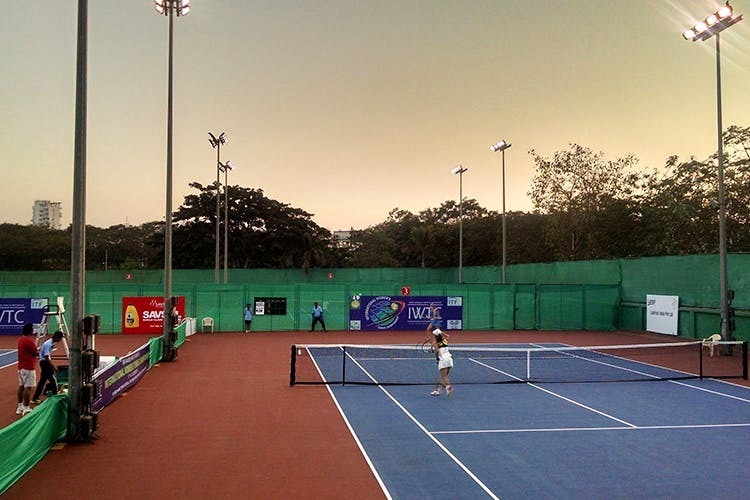 The Bandra Gymkhana boasts of five tennis courts which have emerging talents plying their trade. The courts are flood lit and the fees are subject to various criteria such as age, employment etc. The timings to access the courts are from 6am to 1:30pm and 4:30pm to 10pm. The details about the fees are provided directly by the authorities. Some enthusiastic, selfless and philanthropic people of the Mandpeshwar area of the fast-growing suburb of Borivli have, for quite some time, been toying with the idea of forming an organisation to work for creating some recreation facilities to all age groups. Keeping this in view, Mandpeshwar Civic Federation was formed in 1987. A beautiful, well-laid lawn tennis court facilities include two courts. From Monday to Friday, between 6:30am to 12 noon and 2:15pm to 10pm, as a nominal fee of INR 84, these courts can be accessed. On the weekends, between 6:30am to 12 noon and 3pm to 10pm, pay INR 112 to start playing. At Goregaon Sports Club, an effort has been made to provide world class facilities and infrastructure for the promotion of sports and health. The club has a swimming pool of international size and standards, a fully equipped health club, six acres of open ground for promoting outdoor sports like cricket, football, volleyball, basketball, lawn tennis, etc. and has facilities for indoor games like badminton, squash, billiards, snooker, table tennis, chess, carroms, skating, air rifle shooting etc. There are three courts are available. The day session costs INR 150 for 45 minutes and the night session costs INR 250 for 45 minutes. The timings are from 6am to 10am and 4pm to 10pm.